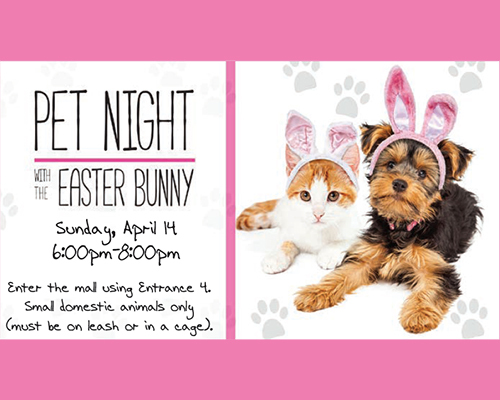 Bring your favorite, four-legged friend to visit with the Easter Bunny! Sunday, April 14 from 6:00pm-8:00pm. Please enter the mall using Entrance 4 (between Sears and JC Penney). Domestic animals only (must be on leash or in a cage). Please ensure your pet is comfortable in situations where other animals are present before bringing them to this event. This event is free to attend. Photos with the Easter Bunny and your pet/family will be available to purchase. Please visit the Easter set or call the mall office at (585) 223-3693 if you would like more information.